Concrete countertops give you that industrial look as a decor accent in your kitchen. They are unique in design, but are they worth it? Let’s find out. This type of countertops is appealing in kitchen design for the industrial and rustic look. They make a contrasting accent in modern decor and provide an excellent option when it comes to the choice of material. But is this material a viable solution when it comes to practice? Is concrete durable enough as a countertop? Is it easy to maintain? How much does it cost? We’ll answer all of these questions and more in this article. What is a Concrete Countertop Exactly? What is the Best Mix for Concrete Countertops? 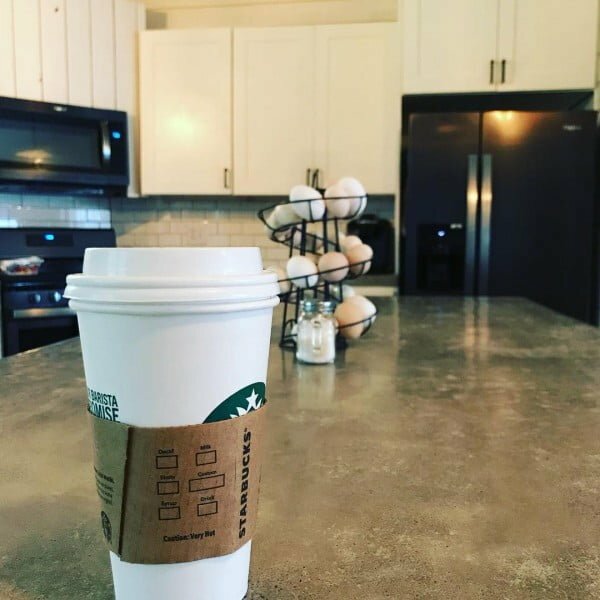 What Are the Popular Colors for Concrete Countertops? How Do You Stain Concrete Countertops? Are Concrete Countertops Less Expensive Than Granite Countertops? Concrete countertops are essentially countertops made from the concrete material. Manufactures typically cast them in molds designed according to a customer’s specification. For this reason, each concrete countertop tends to be unique. The best mix for concrete countertops is essentially one with a low shrinkage potential, high early strength and high flexural strength. The most popular colors for concrete countertops include natural gray concrete, dark charcoal gray, soft sage green, light cool gray and tan. 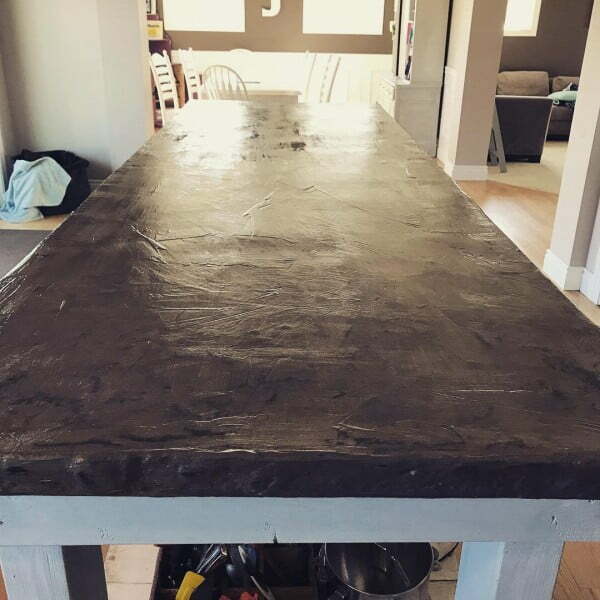 Here are the steps you should follow when staining your concrete countertop. Step 1: Select the correct countertop mix. For instance, a countertop mix with no more than 10% fly ash is ideal for acid staining concrete countertops. The problem with fly ash is it typically affects color development and reactivity when acid staining an integrally colored concrete countertop, causing color variation in the countertop. Step 2: Choose the right form release agent. In essence, you should pick a colorless form release agent that will leave no trace residue and scum on the surface of your countertop. In particular, you should avoid oil and solvent-based form agents because they typically leave trace residue, making it virtually impossible to acid stain a concrete countertop. That said, before you acid stain your concrete countertop, clean it thoroughly with water and an organic degreaser. What’s more, ensure it is completely dry before you acid stain it. Step 3: Some concrete countertops, such as pre-cast countertops, are generally too smooth to stain. If you have such a countertop, you should sand it with a 200-grit sanding pad before staining. This will open its pores, allowing the stain to penetrate the surface of the countertop. At the same time, apply either Deco Gel Acid Stain or Acid Stain to improve the activation time. To apply the acid stain, use a foam brush or a pump-up sprayer. On the other, you can use an artist brush, plastic trowel or foam brush to apply the Deco Gel. If you desire a darker color, leave the stain on longer than the minimum recommended duration. Once you achieve the color, you want, neutralize the acid with an alkaline solution, such as a solution of water and baking soda. After this, clean your countertop and allow it to dry. Step 4: If you decide to polish your countertop, apply a hardener/sealer and allow it to dry. Once the sealer is completely dry, polish your countertop with a suitable sanding pad (at least 400-grit) until you achieve the desired finish. 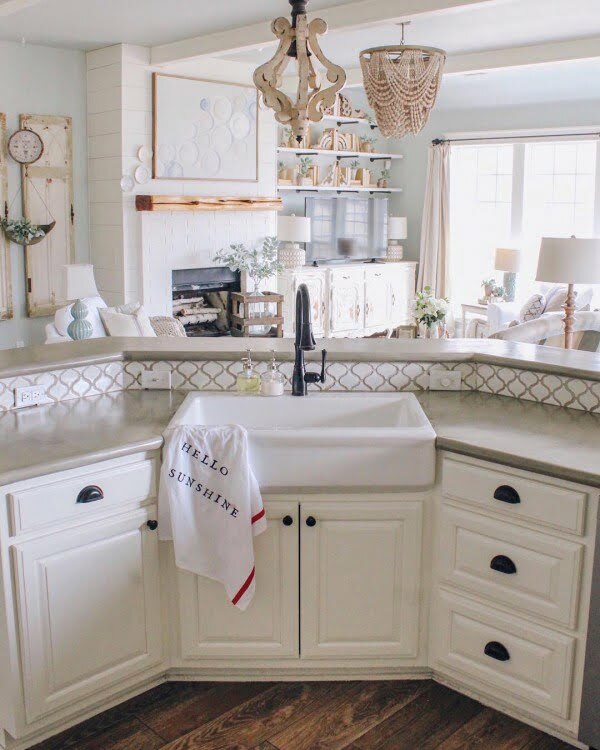 Many design options – Thanks to a wide range of decorative techniques, design options, and finishes, you can make your concrete countertop look as beautiful as the natural stone countertop. For instance, you can acid stain your concrete countertop to make it look similar to slate or granite countertops, with colors ranging from light to dark. What’s more, you can tint your concrete countertop with a wide range of colors to match your cabinets, flooring or décor. At the same time, you can use various texturing techniques to increase the beauty and uniqueness of your concrete countertop. To enhance the beauty of your concrete countertop, you can embed materials such as recycled glass, stone, and shells in the concrete. 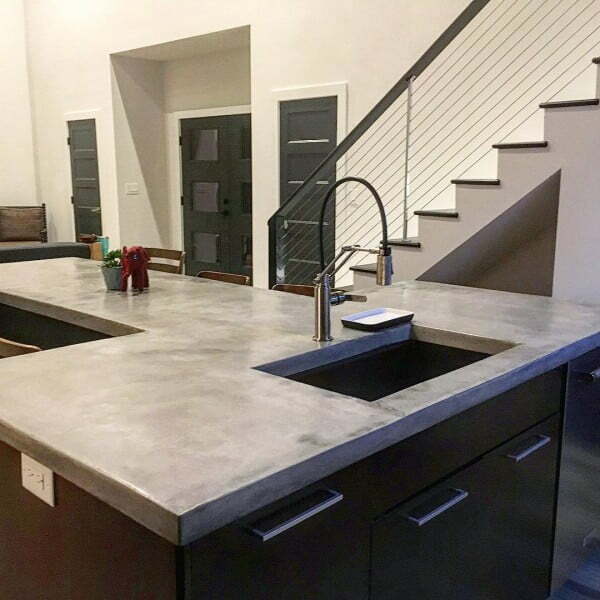 Overall, you can integrate your concrete countertop with virtually any stain or color. Moreover, you can cast your countertop in any shape or size. Durable – Because concrete is inherently robust and durable, it is resistant to scratching and chipping. To put it another way, it can last decades with little maintenance. This means you would not necessarily have to repair or replace your concrete countertop regularly, meaning you can save a lot of money in the long run. Heat resistant – Concrete is a bad conductor of heat, meaning it is heat resistant. Because it is not susceptible to heat damage, it is an ideal countertop material for bathroom and kitchen countertops. Environmentally friendly – Concrete is not only an environmentally friendly material but also completely recyclable. However, some concrete countertops do contain other toxic substances. For this reason, you should be careful when buying concrete countertops. 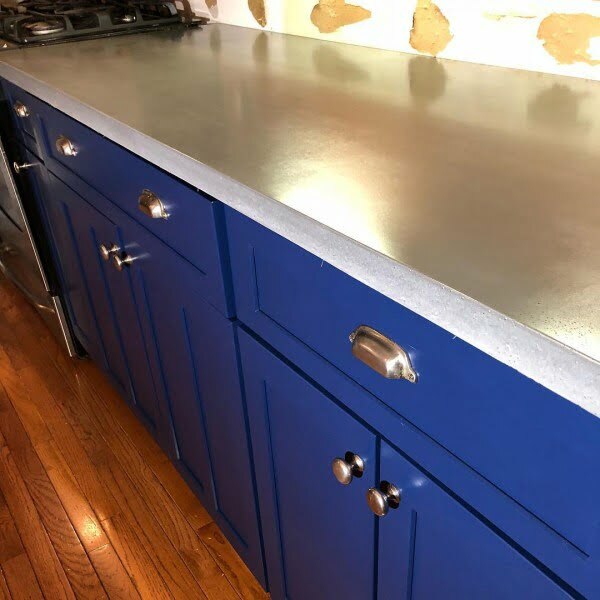 Minimal seaming – If your concrete countertop has seams, you can use a seam filler to minimize the appearance of the seams, making them almost invisible. Unique look – Concrete countertops tend to develop a patina over time, giving them a unique look. 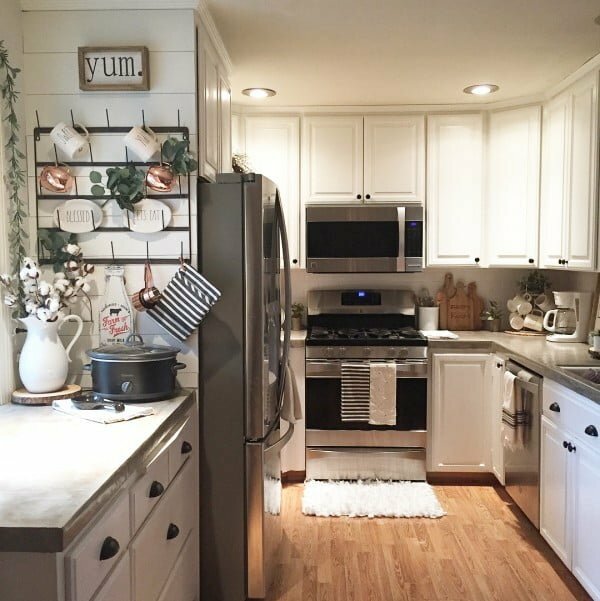 Expensive – With prices ranging anywhere from $75 to $150 per square foot, concrete countertops are relatively costly, especially when compared to natural stones such as granite and marble. For comparison, the price of granite countertops ranges from $45 to $200 per square foot, whereas the cost of marble ranges between $40 and $100 per square foot. Requires sealing – In its natural state, concrete is a highly porous material. This means it needs sealing to waterproof it and make it stain resistant. Sensitive to heat — Granted, in its natural state, concrete is heat resistant. However, sealing makes concrete countertops susceptible to heat damage. Prone to cracking – Concrete is susceptible to cracking. To minimize the risk of breaking, countertop manufacturers use materials such as fiberglass and wire mesh. However, this does not eliminate the threat. Concrete countertops cost anything between $65 and $85 per square foot, minus installation costs. However, if you go for a customized option, expect to pay upwards of $130 per square foot. On average, these countertops cost about $100. If you intend to hire a professional installer to install your countertop, expect to pay the installer anything between $40 and $50 per hour. As mentioned above, the average cost of concrete countertops is about $100 per square foot, exclusive of installation costs. On the other hand, the average price of granite countertops is around $75 per square foot. This means that concrete countertops are generally more expensive than granite countertops. A concrete countertop is essentially a countertop made from the concrete material. Such a countertop is durable, heat resistant, environmentally friendly and beautiful. However, it is also expensive, prone to cracking and sensitive to heat.